NBC, George Spelvin, Good Cemeterian, we're running out of coconuts. Today is Tuesday, November 15, the 320th day of 2016, with 46 days remaining. There are nine days until Thanksgiving, 36 days until the winter solstice, 39 days until Festivus, 40 days until the start of Hanukkah, 41 days until Christmas Day, 67 days until Donald Trump becomes president of the United States, and 723 days until the November, 2018 mid-term election. 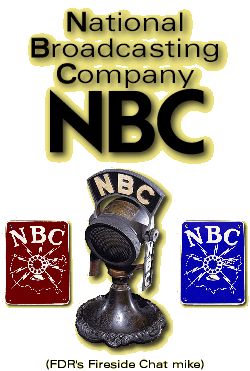 On this day in 1926, The NBC Radio Network began broadcasting. On January 1, 1927, NBC formally divided their respective marketing strategies: the "Red Network" offered commercially sponsored entertainment and music programming; the "Blue Network" mostly carried sustaining- or non-sponsored- broadcasts, especially news and cultural programs. Various histories of NBC suggest the color designations for the two networks came from the color of the pushpins NBC engineers used to designate affiliates of WEAF (red) and WJZ (blue), or from the use of double-ended red and blue colored pencils. After losing a legal battle with the FCC which ordered NBC to divest itself of one of its networks due to monopoly concerns, parent company RCA sold the NBC Blue Network to the American Broadcasting System (later, the American Broadcasting Company, or ABC) for $8 million in 1943 (about $112 million in 2016 dollars). Among other things, today is also George Spelvin Day. George Spelvin is a fake name traditionally used by an actor who plays two parts in a play, so that his name will not appear twice in the program. Click on the link for a description of other uses. A Florida man known as "The Good Cemetarian" has made cleaning the headstones on veterans' graves his life's goal. As of this writing, The KGB Quotations Database contains 41,548 entries. Check it out. and Heathcote Williams, English anarchist poet, actor, political activist and dramatist..
"The trouble with this country is that there are too many politicians who believe, with a conviction based on experience, that you can fool all of the people all of the time." Yesterday we quoted Washington, DC-based professor Allan Lichtman, who predicted last month that Donald Trump would win the election and also that he would probably be impeached "either by doing something that endangers national security or because it helps his pocketbook." Let's ignore everything else wrong with the upcoming Trump presidency, and focus just on those two items, national security and conflicts of interest. If you recall, Trump said he would turn the operation of his businesses over to his children, which he- and no one else remotely familiar with the term- called a "blind trust." So the Trump kiddos will run the shop. The problem is, they're also an integral part of Trump's transition team. As the head of a private corporation, Trump really has few trusted associates and counselors outside his family, so he depends on his children for advice and support. While it's being disputed by some sources, others have claimed that Trump is attempting to get top secret security clearances for his children, Donald, Jr., Eric, and Ivanka, and for Ivanka's husband, Jared Kushner. So, how's this supposed to work? They show up at the White House in the morning, get the top secret lowdown on what's going on in the world, then head back to Trumpland and, of course, do nothing to capitalize on the information or tip off the scores of business partners Trump has across the world? Even if the report is inaccurate and Trump is not seeking security clearance for his kids, it's likely they could nonetheless be exposed to sensitive or classified material. Rep. Elijah Cummings (D-MD), the ranking Democrat on the House Oversight and Government Reform Committee, requested a formal congressional investigation into Donald Trump's "financial arrangements" yesterday, to examine Trumps's multi- national business connections for potential conflicts of interest. "I am writing to request that the Oversight Committee immediately begin conducting a review of President-elect Donald Trump's financial arrangements to ensure that he does not have any actual or perceived conflicts of interest, and that he and his advisors comply with all legal and regulatory ethical requirements when he assumes the presidency," Cummings wrote in a letter to Rep. Jason Chaffetz (R-UT), the committee chairman. Given Trump's refusal to release his tax information, as all modern Presidents have done, little is known of the president-elect's connections with overseas companies and governments. Frankly, my real fear is not that Trump will abuse his position, but that the Executive branch will implode due to sheer incompetency and be unable to function. It was revealed last week that Trump's team was unaware that the current staff of the West Wing- all 4,000 of them- will leave when President Obama's term is over, and that Trump has to replace them with his own appointments. By this time, prior transition teams would have already been hip- deep in applicants, half-way through the interviewing process, and would have actually started making job offers. It would appear Trump and his crew have latched onto the pomp, but forgotten about the circumstances. Adult FriendFinder, the sexually explicit dating site, and several affiliate websites hit with one of the biggest data breaches ever. More than 412 million user accounts may have been, pardon the expression, exposed. The number seems large, but the Adult FriendFinder data stretched back 20 years and included information such as usernames, emails, join dates and the date of a user's last visit. Unencrypted passwords were also included in the data stash. The company was hacked last year as well, but "only" 3.5 million accounts were affected then. The Caribbean is running out of coconuts. Storms, droughts and the Lethal Yellowing disease, which affects several species of palms, including coconuts, have wiped out entire farms. Growers have to take appropriate action and make necessary investments to boost yields, and the UN's Food and Agriculture Organization says Caribbean plantations have shrunk by about 17 percent since 1994. The solution is to plant more coconuts and take better care of them, but the task is daunting- and expensive- for growers. As a detector of electromagnetic radiation, it's not very good... it only operates on one axis and it's unshielded, so it can be set off my all sorts of spurious emissions, from cell phones to camera batteries. That's what makes it such a great device for tracking ghosts..
Don't you hate it when a favorite show goes a winter hiatus, and find you've lost interest by the time it returns in the spring? The networks have noticed, especially after the ratings collapse suffered by many of their series last year. Almost heaven, indeed. Pamela Ramsey Taylor, director of the non-profit Clay County Development Corp. in Clay County, West Virginia, posted on Facebook "It will be refreshing to have a classy, beautiful, dignified first lady in the White House. I'm tired of seeing a (sic) Ape in heels." Clay (pop. 648, total county population just over 9,000) mayor Beverly Whaling responded with "just made my day Pam." Ms. Taylor said the backlash to her Facebook post "has been a hate crime against me," and that she has received death threats. Both women took down their Facebook pages, but nothing on the Internet is every really deleted; screen caps started appearing all over the place. A town council meeting has been scheduled to discuss the matter. Recent reports say Ms. Taylor had been "removed from her position" but it's not known if she's still with the agency. Donald Trump carried Clay County with 77.4 percent of the popular vote.